Experience Nature Adventures in Blue Mountain! Treetop walking in a 200 year-old forest! 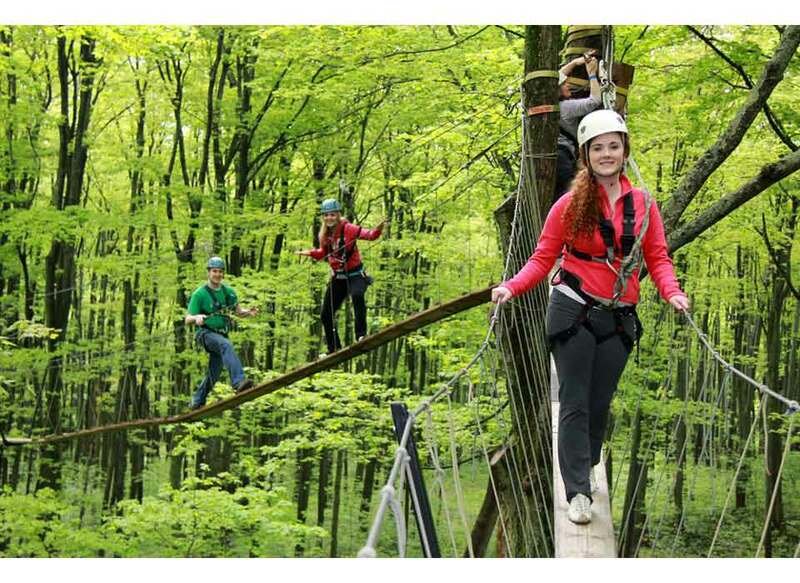 High in the treetops, Scenic Caves Nature Adventures has created a web of platform decks spun together by cables and airborne walkways a mere 25cm wide. Where a walkway won’t take you, you’ll grab a zip cable and swoosh through the woods, spanning valleys up to 1,000 feet deep, until you arrive at your destination. On platforms you will take water breaks and learn about the unique ecological history of the Niagara Escarpment, and the flora and fauna of the 200-year old forest. Harnesses, helmets and all the equipment you need are provided. Each intimate group has two expert guides to assist, demonstrate and help interpret the experience. Your two hour guided eco-adventure tour will leave you with indelible memories of natural beauty and incomparable thrills to last a lifetime. 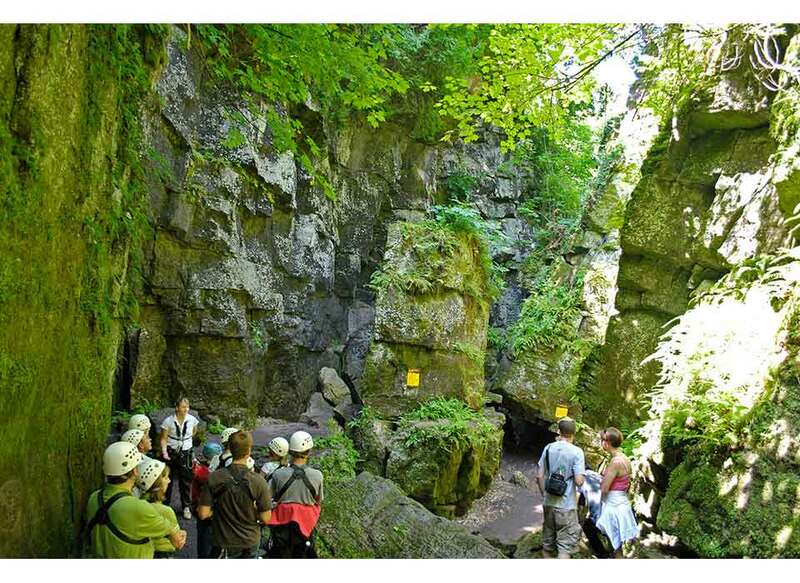 Scenic Caves Nature Adventures provides a rare opportunity to be at one with nature. Explore ancient caves. Traverse Ontario’s longest suspension bridge. Walk amidst the tree tops over deep valleys. In winter, ski and snowshoe through winding trails. In business for 70 years, Scenic Caves Nature Adventures is at the top of Blue Mountain in the Collingwood area, just two hours from Toronto. The property changed ownership in 1994, and since that time Ontario’s Longest Suspension Bridge, a Nordic Centre, Gemstone Mining and The Eco Adventure Tour has been added. Your adventure starts here, in a world apart that is millions of years in the making. Height / Weight Restrictions: Guests must be between 70 lbs and under 250 lbs. Guests must be over 4’8″ tall or with someone who can reach 6 foot 2 inches high. Advance Check in: Guests must arrive 30 minutes prior to the scheduled tour time in order to sign waiver, get harnessed and receive preparatory instructions. Guides: Two qualified guides lead groups of up to 15 guests. A couple of zip line staff assist each group. After receiving your certificate, please call the experience provider to book your reservation. Identify that you are booking a LifeExperiences package and quote the number on your certificate. Be sure to bring the certificate with you. It is your method of payment. Policies subject to change without notice. Must present certificate upon arrival. This offer is valid for two years from date of purchase. This gift certificate is only redeemable for the outlined services as defined in the package. May not be redeemed for cash. This certificate has no implied warranties. LifeExperiences.ca shall not be responsible for any injury, accident, loss, misfortune or damage of any kind (to property or person) relating to any aspect of the above services. © 2019 Main Street Offers Inc. d/b/a Life Experiences. All Rights Reserved.